SEOUL, Aug. 16 (Korea Bizwire) — What started as a humble congregation of 20 Christians at a fringe neighborhood in Seoul 40 years ago has now grown into arguably the world’s biggest Presbyterian church. Myungsung Church now stands on tens of thousands of square meters of land in the southeastern district that became a populous commuter town. It boasts a membership of 100,000 and has schools and hospitals under its wing. The miraculous success story earned its founder, Rev. 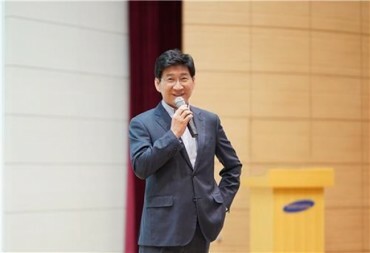 Kim Sam-hwan, a reputation as one of the most revered religious leaders, inspiring Christian pastors at home and abroad. But the pastor has suffered a precipitous fall from grace amid controversy over his decision to name his eldest son, Rev. 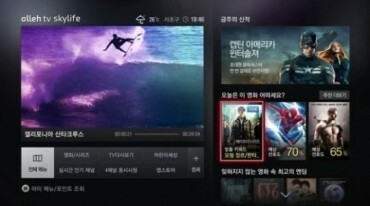 Kim Ha-na, to succeed him, granting the younger Rev. Kim the last say in controlling the church’s massive finances. Despite growing protest and opposition by the Christian community and civil society, the junior Kim took office in November last year following his father’s retirement. 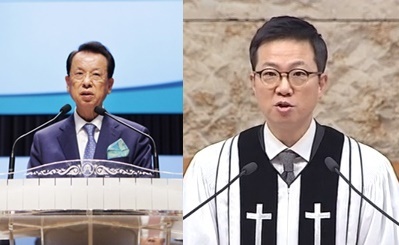 In a bid to reverse the decision, a group of opposing pastors filed a complaint with the General Assembly of the Presbyterian Church of Korea, the Protestant denomination for Myungsung. They demanded a ruling over whether the succession is in violation of the denomination’s law banning the succession of a retiring pastor by a close family member. The Theological Education Committee of the denomination’s General Assembly last week ruled in favor of the succession, with eight of its 15-member panel voting to allow it. Rather than ending the row, the panel’s decision further fanned anger among the Christian community and civic groups. “The General Assembly law prohibiting family succession of pastorship became null and void with the decision,” a nationwide association of Protestant pastors said in a statement. The head pastor of the prominent Somang Presbyterian Church, Rev. Kim Jie-chul, also came forward to criticize the church decision in an online letter addressed to the senior Kim last week. Despite the growing criticism, the Kims remain adamant. Addressing Sunday services following the ruling, the pastors celebrated the denomination’s decision approving the succession, giving words of thanks to supporting church members. “Because I have ears and eyes and I am no shameless man, I feel hurt, troubled and sorry (regarding the situation),” Rev. Kim Ha-na said in his sermon. “People in and outside of the church have a feeling of doubt or denouncement … but such doubt and criticism could become an opportunity for us to resort back to God,” he said, essentially dismissing the calls for resignation. The confrontation is likely to further divide the Christian community and send it into greater disarray. The opposing seven members of the panel offered to resign their seats following the panel’s ruling in favor of the succession. The CLF, comprising 500 Christian attorneys, joined the campaign against Myungsung Church, this week, calling into question the legality of the succession process. 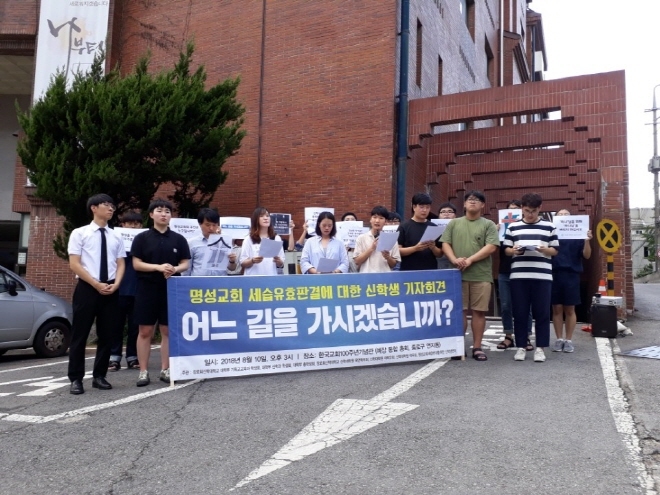 Groups of student representatives and faculties from the denomination’s Presbyterian University and Theological Seminary also raised their voice, calling for disciplinary action on Myungsung and vowing to fight to the end. 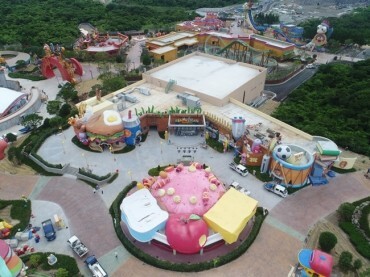 With some of the angry opponents reportedly considering action to bring the issue to the secular court, the Myungsung Church case is likely to pose another challenge to the Korean Christian community after a series of scandals have engulfed other mega churches in the country, one of the religion’s biggest strongholds.